Home affordability moved higher last quarter, boosted by the lowest mortgage rates in history, a rise in median income, and slow-to-recover home prices throughout TN and the country. 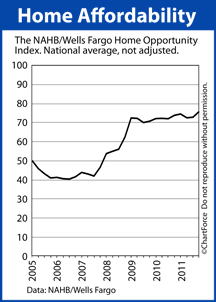 According to the National Association of Home Builders, the quarterly Home Opportunity Index read 75.9 in 2011’s fourth quarter. More than 3 in 4 homes sold between October-December 2011, in other words, were affordable to households earning the national median income of $64,200.